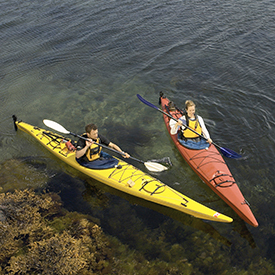 Tourism and recreation support a wide range of businesses in the nation’s shore-adjacent zip codes, from restaurants, hotels, aquariums, and marinas to boat manufacturers and sporting goods stores. The following facts are based on the latest available economic data1 (2015). Almost 2.3 million people are employed by ocean-based tourism and recreation. Workers in the ocean-based tourism and recreation sector earn over $55 billion in annual wages. Ocean-based tourism and recreation contributes approximately $116 billion in gross domestic product to the national economy each year. The ocean-based tourism and recreation sector employs more Americans than the entire real estate industry, as well as more people than building construction and telecommunications combined. The industry added 79,000 jobs (3.5 percent growth) from 2014 to 2015—growing significantly faster than the U.S. economy grew as a whole (2.1 percent growth). 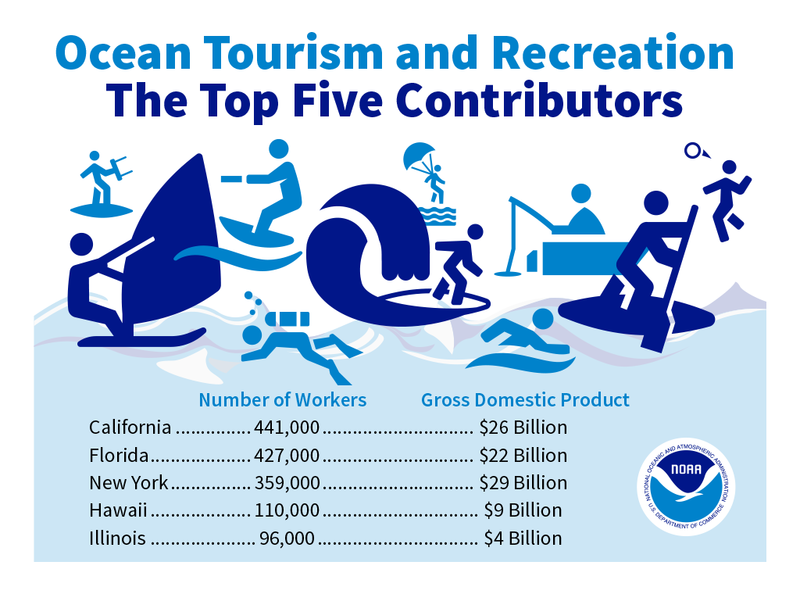 California, Florida, New York, Hawaii, and New Jersey are the five biggest contributors to ocean-based tourism and recreation, accounting for more than half of this sector’s total employment and gross domestic product in 2015. *Note: Economics: National Ocean Watch (ENOW) is a NOAA economics database on the Digital Coast that features time-series data focused on the six economic sectors that are dependent on the oceans and Great Lakes. ENOW's tourism and recreation statistics are good indicators of coastal and ocean tourism because they estimate the ocean-dependent portion of business for hotels and restaurants by including only those establishments located in shore-adjacent zip code areas, and they exclude all forms of sports and entertainment that are not ocean-related. Statistics for the leisure and hospitality sector, on the other hand, include all hotels and restaurants located anywhere in a shore-adjacent county, many of which are far from the coast and have very little business connected to ocean tourism. These statistics also include activities associated with all forms of sports and entertainment, including sports arenas (e.g., professional baseball and football stadiums), Broadway plays, casinos, and racetracks.